In our last article, we covered aspects of a phenomenon the New Age calls “walk-ins.” This is the belief within New Age circles where a highly advanced spirit exchanges places with a spirit that cannot grow or evolve spiritually any further in its present conditions. So, the current spirit inhabiting a particular body agrees to leave so that the more spiritually advanced spirit can take up residence in that adult body. The spirit that leaves goes to another zone to wait for an opportunity to take up residence in another body. This is essentially reincarnation by another name. Christians should be aware that the concept of “walk-ins” does not exist and neither does reincarnation. Demonic possession does exist but that is entirely different from what the New Age calls “walk-ins.” It’s a fantasy that is accepted as reality by gullible people who have been taken over by the swell sounding subterfuge (lies) of the New Age. However, as stated previously, it is very helpful to understand terms, verbiage, and tenets of the New Age because it provides us with insight into how Satan works and deceives millions of people throughout the world. We also need to keep in mind that his overriding goal – the one that led to his original fall – found in Isaiah 14:14 is to “be like the Most High.” It’s important for Christians to grasp this fact. Everything Satan does; everything that motivates him is to fulfill this goal of his. God has allowed Satan to do what he can to fulfill it and He will continue to allow it because ultimately, it feeds into God’s purposes of glorifying Himself. Satan will have every opportunity to “be like the Most High,” even having one particular individual at the end of this current age to lead the entire world in a rebellion against God Almighty. How does this glorify God? On several fronts. First, it gives Satan untold opportunities to create rebellion against God and in so doing, weeds out those who would never under any circumstances willingly kneel before God as Lord and Savior. The demarcation line is clearly set by Satan and those who follow his path end up doing the same thing he does. This puts them on a path that not only walks away from God but truly opposes Him on every front. Their decision becomes their fate. Second, the way things are working, everything is moving to eventually bring Satan himself (through Antichrist), out into the open. It cannot be avoided. Satan will so possess and empower Antichrist that the two will be as one. Satan will gather his troops, his supernatural power, his might, and his tenacity to oppose Jesus as He returns physically to this earth. That will be Satan’s final undoing. Having worked directly through Antichrist, Satan’s power and arrogance will be on display publicly and the Lord Jesus, upon His return, will destroy Satan’s work also publicly. Satan will be bound in the bottomless pit for 1,000 years and Antichrist and False Prophet will be tossed into the Lake of Fire. In the meantime however, Satan still hides behind human beings, deep in the shadows, though I would venture a guess that he shows his power to a special few human beings whom he allows to think have “earned” the chance to see Satan’s “glory.” For the most part though, when we see outbursts of the enemy, it’s usually by human beings who are possessed or thoroughly darkened in their minds as Paul indicates in Romans 1. People with darkened minds cannot – do not – think straight. They determine truth via their feelings. We call this emotional virtue as often people are made to do something or think a certain way because of how something pulls at their heartstrings as opposed to the truth of Scripture. This has been part of godless, global society for generations, but we’ve also seen it steadily creeping into churches for the past four or five decades. In the end, it has made strong inroads and as it does, it pushes God and the Bible out. But as far as people with darkened minds are concerned, they see no disparity in their actions or their words. If they do something wrong, the only problem was getting caught, not the action itself. Even then, they often continue on as if nothing occurred. Bill Clinton is alleged to have raped numerous women and we know for certain that he had sexual contact with an intern, which became not only national headlines but led to his impeachment. He remained in office because there were not enough votes to actually remove him, though impeached. This alone tells us the level of emotional virtue within Congress. It’s not that he had sexual contact with an intern. That’s between him and his wife. He ultimately was impeached for lying to a members of Congress under oath. I want to be clear here that there are people on both sides of the aisle who succumb to emotional virtue, allowing it to lead them and make decisions for them. Even though there is nothing absolute about using emotional virtue to make decisions, people using emotional virtue actually believe their decisions are based on absolutes to a degree. This is in spite of the fact that the exact same situations might merit one answer for one person and another for another person. You may recall Donna Brazile, the individual who was caught providing Hillary Clinton with the questions that were going to be asked in a presidential debate. The Left likes to talk about Russia allegedly hacking the election, but in reality, Brazile was doing her best to give Hillary a strong leg up against Donald Trump. This was also an attempt to hijack the election but the Left has nothing to say about that nor do they care that Hillary lost because she was a lousy candidate and people supported a man who supports the rule of law. But in keeping with the idea of having a darkened mind, you can see from a recent tweet from Donna Brazile that she is high and mighty regarding something to do with President Trump as if she has any reason to have any high ground whatsoever. 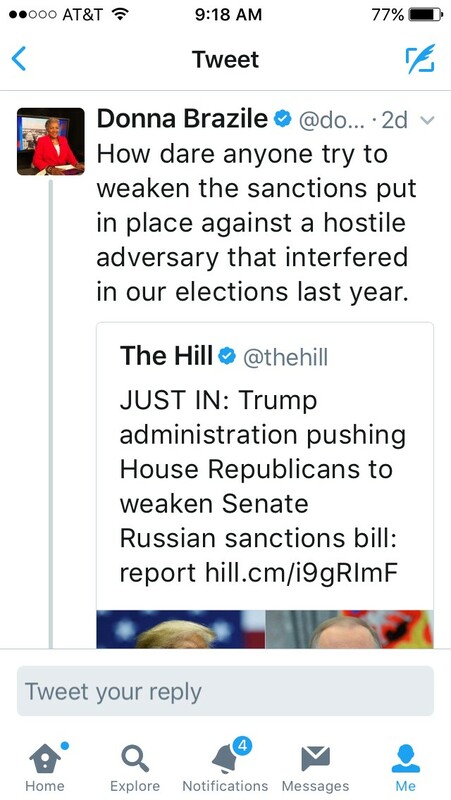 Note she states emphatically that Russia “interfered in our elections last year.” As far as many on the Left are concerned, this is fact. It’s not been proven at all, but we know Brazile tried to help Hillary. But can Brazile really take the “how dare anyone” approach? Not really because she lost her integrity when it was learned that she was illegally and unethically providing the debate questions to Hillary. Notice also she says Russia is a “hostile adversary.” When did Russia become such? It was clear during the Obama presidency that he and many within his administration like Hillary Clinton got on well with Putin and Medvedev. In fact, it seemed like many within the Obama administration bent over backwards where Russia was concerned. Now, all of a sudden, Russia is our worst enemy? It makes no sense to thinking people, but we are not dealing with thinking people. We are dealing with emotional people, folks who arrive at truth via their heart, not their brains. “By any means necessary” is their motto and they prove that on a daily basis. Her conscience is clear because she effectively doesn’t have one! It has been “seared” (1 Timothy 4:2). A person with a seared conscience has no “pangs” when they do something wrong. Their conscience has been effectively shut down into silence. It no longer works. Read what else she said during that interview. The problem of course is that while it is fine to ask questions, it is illegal or certainly unethical to obtain debate questions and then hand them to one of the debaters so that they have a leg up. This would be like obtaining the questions or answers to the final exam in one of your classes so that you could ace it. If you are someone who thinks “Hey, if a person can obtain that information, more power to them!” then you are part of the problem and very likely have a seared conscience yourself. That would be cheating. In effect, you would be lying because you would be giving the impression that you are on the same footing as all the other students in your class, when in point of fact, you have much more going for you because you were able to obtain the questions/answers to the test questions. The dementia that appears to exist within many on the Left is largely due to what Paul discusses in Romans chapter one. Read it several times to understand how this downward spiral starts and where it leads to. It’s not pretty and the person is still very culpable. They are held accountable before a holy God. Those like Donna Brazile get to a point of a seared conscience because they have ignored it’s pangs for too long. They have deliberately and repeatedly chosen to do things their way and not God’s. They are not interested in His truth or fair play. They are interested only in serving Self and that much is clear. The term “walk-ins” implies that the person is not responsible for their actions or words. Their resident spirit within them simply changed places with another spirit. They couldn’t help it. It simply happened. There is much about the New Age that seeks to absolve people of any responsibility at all. This is one of the biggest reasons people chase after it. It’s their attempt to fulfill parts of Psalm 2 where God draws us a poetic picture of people who do everything they can to throw off God’s “chains.” He allows it if that’s what they really want, but in the end, they will rue the day God threw them over to themselves. More and more people today are doing everything they can to throw off even the very thought of God. God is giving them over to themselves, which results in people who are demented, darkened in their thinking, incorrigible, and plainly put, simply evil. A person doesn’t have to be possessed for this to occur. It happens all by itself when people do whatever they can to reject God and His truth. Entry filed under: 9/11, Agenda 21, alienology, Atheism and religion, Barack Hussein Obama, christianity, Communism, Council on Foreign Relations (CFR), Cultural Marxism, Demonic, devil worship, Eastern Mysticism, emergent church, Emotional virtue, eternity, Global Elite, Life in America, Maitreya, new age movement, Political Correctness, Politically Correct, Politics, Religious - Christian - End Times, Religious - Christian - Prophecy, Religious - Christian - Theology, salvation, Satanism, second coming, Shadow Government, Transhumanism. Tags: absolute truth, antichrist, donald trump, donna brazile, false prophet, Isaiah 14:14, medvedev, putin, romans 1, satan, walk-ins. Well said, but methinks in too many words wasted on the follies of satan dominated folk including our looney liberals among the “many”, in Jesus’ words, who will use their God given free will to defy Him on earth. Unless repenting before death, they are unknowingly walking the wide way leading to condemnation and eternal conscious existence and constant suffering in a real hell according to the ever truthful Jesus…not transient purgatory or peaceful soul sleep or total annihilation, etc (see Luke16;19-31). Shakespeare’s Hamlet contemplating suicide as the easy way out of his problems got it partly right, paraphrasing his soliloqui .. to die, to sleep,……perchance to dream? Ah, there is the rub! For in that sleep what dreams may come when we have shuffled off this mortal coil ….far better to suffer.here…than to face things we do not know” . But Hamlet was wrong, for he could have known if he had read the 1611 edition of the King James Bible version containing the words of stern Judge Jesus. Our primary job as true Christians, by definition believers and followers of the ultimate guru Jesus, our Lord and Savior, is NOT to REFORM society or to stop sinners from sinning, but to INFORM unbelievers that they must become born again as the ONLY way to heaven as Jesus told Rabbi Nicodemus and as clearly spelled out in John 14;6. This verse in precise unambiguous N.T. koine Greek containing 6 absolutes, in my opinion, is the most revolutionary and exclusionary indeed intolerant verse in the Bible spoken by the embodiment of absolute truth, Jesus.